Last weekend I attended the National Writers’ Conference, the two day flagship event of the Emerging Writers’ Festival, held at Melbourne’s Town Hall. The conference is held over Saturday and Sunday with a range of panels hosted by leaders in their field. With such a fabulous schedule it was a challenge choosing which panels to attend. I selected eight across both days, and geared them towards personal interest as well as those that would offer some benefit in skill development and sharing of experience. Panel members included the likes of Kylie Ladd, Anna Poletti, William McInnes (who’s a bloody funny bloke), Sulari Gentill, Oslo Davis, James Phelan, Kirsty Murray, and many more wonderfully talented folk. “If you write well no one will notice an adverb or a speech tag, they will be so caught up in your story.” I loved this advice from Sulari Gentill. I know some editors go crazy if even one adverb is used, denouncing it as ‘bad writing’. I totally get why adverbs are considered in this light but sometimes, sometimes … a well chosen adverb works beautifully, in my opinion. “If you don’t write your story then no one will. Find a way to believe you are the best and only person to tell your story,” encouraged English Lecturer and all round cool cat, Anna Poletti. She also advocates getting up from your desk and going for a walk or changing activity to bring what is at the back of your brain to the front. As someone who power walks through challenging plot points and problems, I wholeheartedly agree with this advice. And lastly, the very funny writer and actor, William McInnes, offered this pearl of wisdom, “Never take yourself too seriously, but take what you do seriously. Life is too much fun to disappear up your own arse.” Yes. All in all, it was a great weekend, with lots of take home value. Melbourne is a wonderfully supportive city for writers of any level, and really embraces diversity and inclusivity. 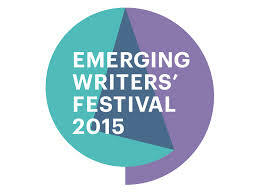 The Emerging Writers’ Festival is a celebration of literature across all mediums, encouraging creativity, innovation and connectivity with a broader writing community. Hope to see you there next year! This entry was posted in Uncategorized and tagged anna poletti, emerging writers, fiction, james phelan, kirsty murray, kylie ladd, Melbourne, national writers conference, oslo davis, sulari gentill, william mcinnes, writing. Bookmark the permalink. Yay adverbs! Glad you enjoyed the session Rebecca – great summary! Good post, and thanks for sharing these bits of advice. It is true editors had adverbs and adjectives. But sometimes they are just needed. We are also told to write short … but why? Is it because people really don’t want a long book (JK Rowling’s books make me think otherwise) or because the editors don’t feel like wading through 1000 pages? I say we write the story we see and then edit it into perfection. And I love the one about not taking ourselves (or our words) too seriously. Really good stuff here. Thank you. Good point on story quality and pacing. It is hard to keep up the pacing over a very long novel without it sagging from its own weight. I have written a fairly long historical novel. I’m in the midst of editing it at the moment. I’ve struggled with how much to take out and what to leave in, but figure if I don’t really care about the character’s actions/words at this point, the reader probably won’t either. So “does it matter?” is stuck up on the wall as the litmus test. Can I still tell the same story without a scene, sentence, conversation, description? Maybe this is why there is an emphasis on writing shorter; there is a lot in books that simply don’t need to be there (including that simply; bad adverb! ).